A great place to visit, an even better place to call home! The Verde Valley is not a town of its own. It's a valley that consists of many little towns. Cottonwood, Arizona is the heart of this unique “valley of enchantment” called the Verde Valley. Besides Cottonwood, the Verde Valley includes Jerome, Clarkdale, Sycamore Canyon, Sycamore Creek, Sedona, Red Rocks, Oak Creek, Camp Verde, Beaver Creek, Clear Creek, Rimrock, Cornville, Page Springs, upper Verde, middle Verde, lower Verde, and more. The Verde Valley is the most captivating place in the state of Arizona, next to the Grand Canyon. 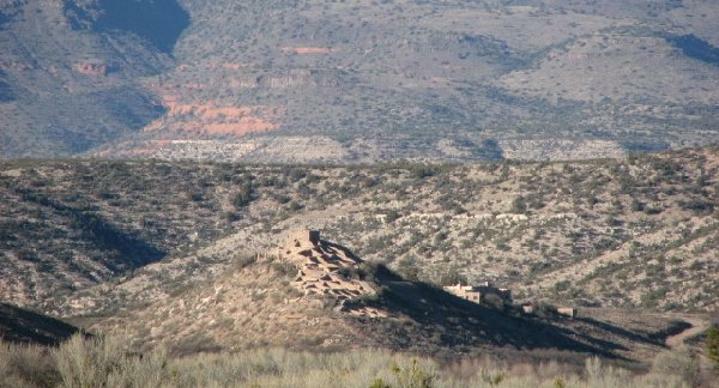 The Verde Valley is rich in history and prehistoric sites. 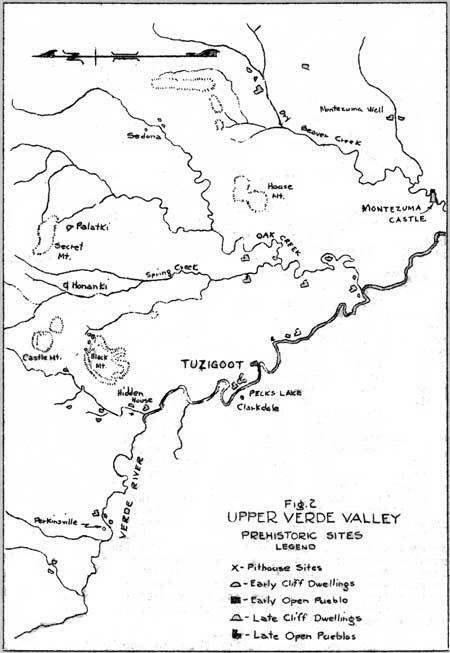 Probable sites as pueblos of forty or more rooms, small cave dwellings, irrigation canals, bluff-top forts and overlooks, and pit house villages, described by archaeologist, Peter J. Pilles, Jr. 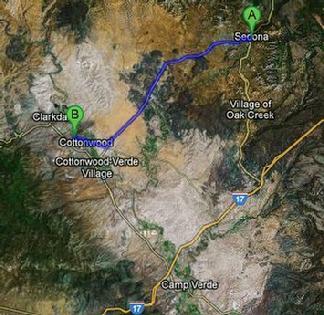 Confirmed prehistoric sites from the Southern Sinagua and Yavapai cultures can be found all along the Verde Valley. Considerable significance is attributed to the Verde Valley ruins because they represent central population segments and show the focus of man's occupation there, between 1300 and 1425, to be along the Verde River. 6) several large pueblos dating to the Tuzigoot phase. A great way to see a vast part of the Verde Valley canyon side is to hike the Sycamore Canyon. One of the most popular hiking trails is the Parsons Trail along the Verde River, where you can find swimming holes and caves. Or take the Verde Canyon Railroad. 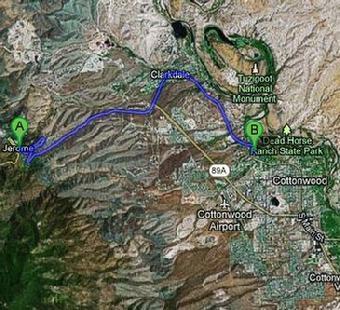 This train ride is another way to see some of the Sycamore Canyon area of the Verde Valley. The Cottonwood Hotel is the closest hotel to the Verde River, the Verde River Greenway Riparian, the Dead Horse Ranch State Park (hiking & biking Trails), the Tuzigoot National Monument (Prehistoric Indian Ruins), Parsons Trail, Clarkdale. Jerome and the Verde train. Please ask for a hiking or trail map/directions if needed. The Verde Valley Archaeology Center in Camp Verde, Arizona, presents a short video presentation about the history of the Verde Valley. For a trailhead production see below. 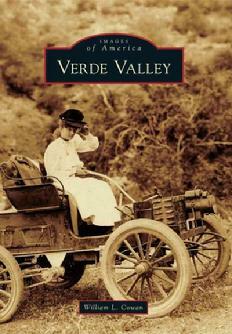 A great source of history, full of photos, this book celebrates the Verde Valley from its prehistoric settlements to the Arizona State Centennial Celebration 2012. Located in the heart of Arizona, between the Sonoran Desert and the mountain highlands of the Colorado Plateau, the Verde Valley has been a pleasant refuge for man and beast for thousands of years. 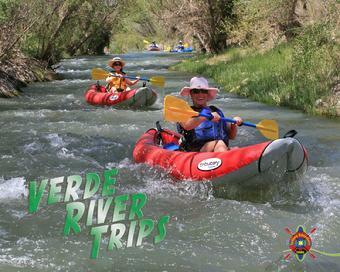 Floating rafts and kayaking is a popular past time on the Verde as it runs through scenic valleys and the Mazatzal Wilderness. The water to wine and other Verde Valley kayak and wine events are a way to explore this area and have some fun! Mostly bass, perch, carp and channel catfish. There is said to be 80 fishable miles, mostly near the Cottonwood Clarkdale area in North Central Arizona and the Dead Horse Ranch State Park lagoons. In 1987, a six mile (10 km) stretch of the river was identified by the state of Arizona as a critical natural resource that needed protection and management. This reach of the Verde River, located between the town of Clarkdale, near the Tuzigoot National Monument (prehistoric Indian Ruins) and the Bridgeport State Route 89A Bridge. The park, which encompasses some 700 acres (2.8 km2), is known today as the Verde River Greenway State Park Verde River Greenway State Natural Area. Images of the Verde River Greenway Cottonwood-Clarkdale area. 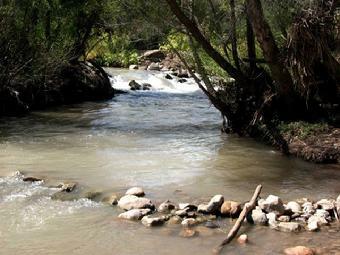 Oak Creek empties into the Verde River near the Alcantara Vineyard Winery & Wine Tasting Room. If you are into wine and hiking, this is a must!!! Your can grab a bottle of wine, or a glass and walk Alcantara grounds towards the Verde River, where Oak Creek connects, find your own private beach and whoa-la!!! Love this place. One of Northern Arizona Vineyards and part of the Verde Valley Wine Trail. 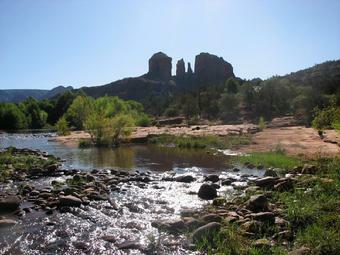 Below is Oak Creek Canyon at the Cresent Moon area, Lower Red Rock Crossing and Cathedral Rock. A favorite spot and a 'healing vortex'. Maps are available at the Cottonwood Hotel. 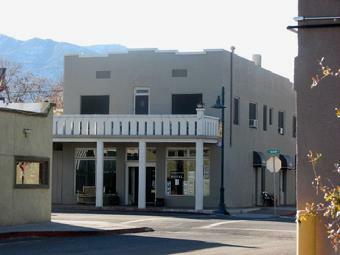 And the Cottonwood Hotel is in the 'Heart' of Old Town, Cottonwood... This location makes a great choice when visiting the Verde Valley offering specialty lodging in the prohibition-era hotel. Also has a main floor studio for extended stay or vacation rental.